Did you know that the average person spends more than 219,000 hours of their lifetime in bed? Whatever that bed may be, it should be amazing both in the comfort and the looks department. Here's a roundup of ABD's favorite beds to rest your head -- from the budget breakers to the best buys for your buck. We love them all. 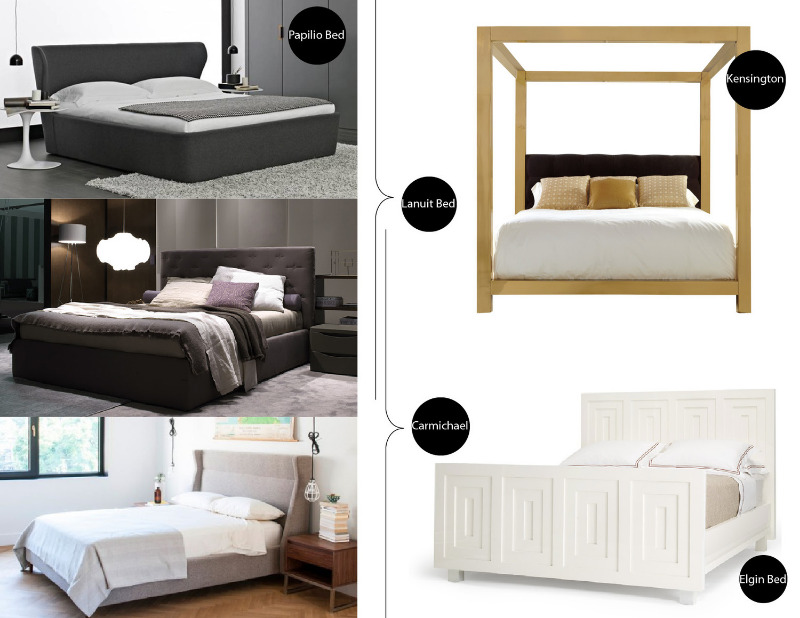 What can we say about B&B Italia's Papilio Bed? Taking the wing back to a new, sleek, contemporary level. We saw it recently upholstered in navy blue linen and almost passed out (no pun intended). It can go masculine or feminine and mix with old and new. We are sold. Bernhardt's Kensington Bed is BANANAS. Brass? Check. Canopy? Check. Modern shape? Yep. Gorgeous and chic rolled into one. We want to dress this bad boy in crisp, white bed linens with a luxe fur throw strewn at the foot and just let the bed shine. One of our new favorite manufacturers on the scene, Jesse Chicago, introduced us to the Lanuit Bed and we are in love. The star-shaped tufted headboard is soft and subtle and is already singing me lullabies. Modernizing the classic, tufted headboard in the perfect way. The Carmichael from Gus Modern is screaming mid-century chic with its modern take on the wingback. Its interestingly-shaped headboard in a neutral linen would be fab for your Don Draper-esque rendez-vous. 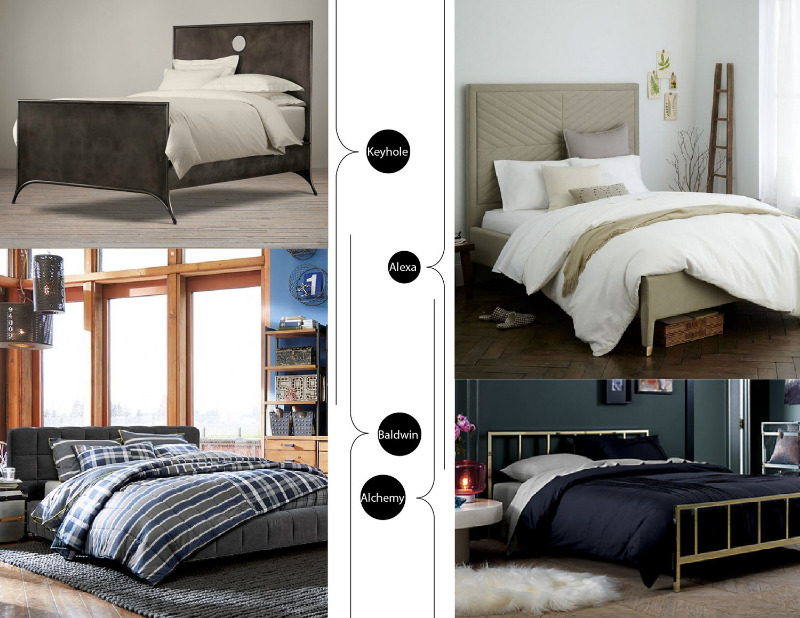 One of our all-time, get-into-our-house favorites is the Elgin Bed from Michael Berman. It's a stunner. The white lacquer head and foot board are clean and classic. We are hooked on the geometry-filled panels. Can you imagine this bed against a crisp, dark painted wall? Not wanting to make a cushy investment where you sleep? These budget-friendly finds (above) are equally as amazing. We are singing Restoration Hardware's praises for this addition to their vast collection of wonderful beds and headboards. The 19th Century Keyhole is a nice material change from your typical wood and upholstered pieces. The metal can be equally dressed up or dressed down in your boudoir. We love the cut-out detail. Digging the statement headboard stitching on West Elm's Alexa bed. Amazing, aztec-y, chevron design and the brass detail on the feet has us going bonkers. Pottery Barn TEEN you said? Yes, we did. Their low-profile Baldwin bed is insane. Squared-off tufting for a little mod touch. And did we mention in comes in DENIM? We die. Oh, and CB2 you had me at the Alchemy bed. Done and done. Brass head and footboard and an amazing price point. Just genius.